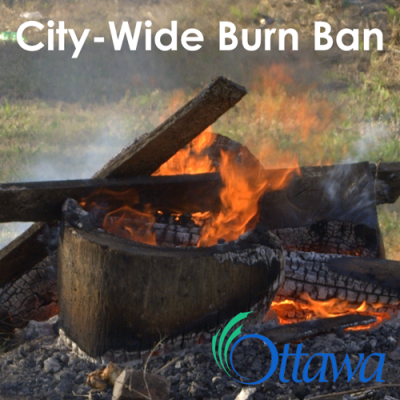 Ottawa Fire Services has issued a city-wide burn ban. It is effective immediately to prevent the rapid spread of fire due to grass and brush fires. This ban will remain in place until conditions improve and the green grass starts to show through dead tall grass. All open air fires are prohibited during a fire ban even for those properties that have a burn permit. There will be zero tolerance enforcement during the open air burning ban. Debris from winter (fallen tree branches, leaves, etc.) increases the risk of fire spread, so this is a preventative measure to keep people and property safe. For additional tips on disposing yard waste, visit Ottawa.ca. Carelessly discarded cigarettes continue to be a major cause of grass fires during these dry periods. Smokers are reminded to please use care when butting out. Do not throw lit cigarettes out vehicle windows. Be sure that cigarettes are completely out and discard in an appropriate waste recepacle. Fire Permits are available at all Client Service Centres and Ottawa Fire Services Rural Administration Offices. A list of these sites , hours of operation and more information on fire permits can be found on Ottawa.ca/fire or by calling 3-1-1 (613-580-2400).